The truth is that the Easter egg hunt is right up a toddler’s alley. I mean, it’s practically MEANT for toddlers. The problem comes when you throw in older kids as well. 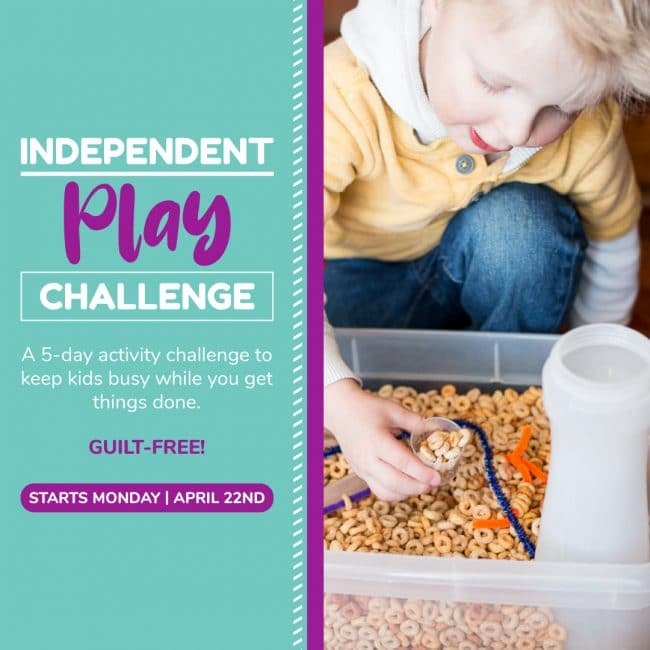 Then, what should have been a ton of fun for your toddler can be frustrating and tantrum-inducing (and the life of a toddler is frustrating and tantrum-filled enough already). 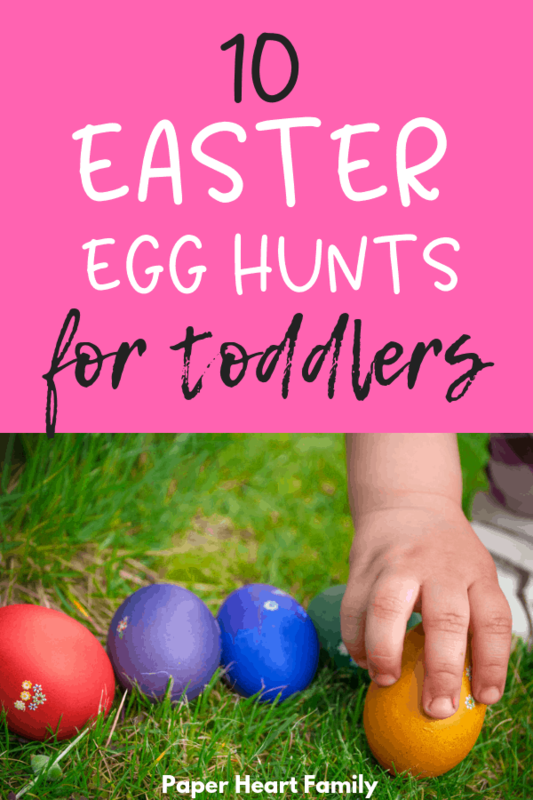 These Easter egg hunt ideas for toddlers are designed to keep your toddler happy and un-frustrated. Believe me, you don’t want to take a group of kids, hide a bunch of eggs and simply let the kids loose. Your poor toddler is going to be completely overwhelmed and will come out empty-handed. When your Easter egg hunt involves toddlers, you need to be a little more prepared and strategic. You need to make it simple enough that your toddler has a chance at success. Tip: You don’t have to just pick one of these ideas. 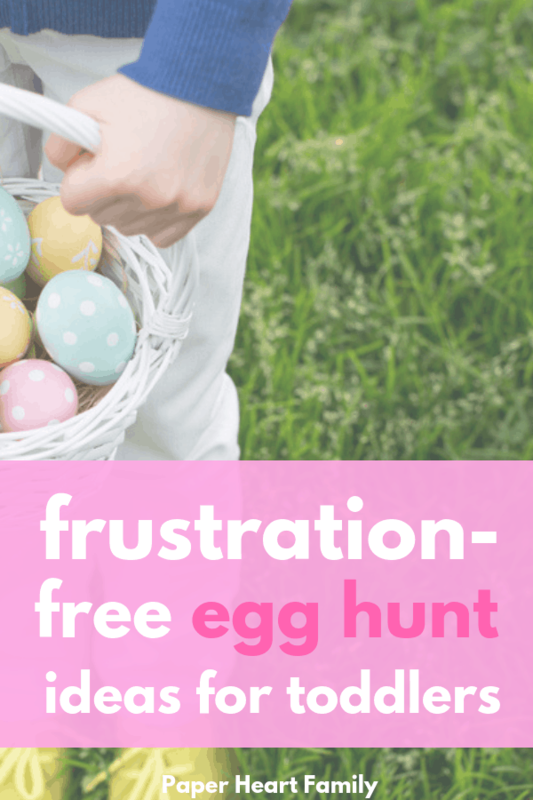 You can do quick Easter egg hunts at home with your toddler even before Easter. I think this is a great idea also because it will help your toddler to understand what an Easter egg hunt actually is, before the big event. Check out 13 indoor Easter egg hunt ideas that are perfect for toddlers for even more ideas. This method is best if the only kids involved in your egg hunt are toddlers. Simply choose a small area in your yard, throw the eggs on the ground, and let your toddler collect them. Seriously, take advantage of the fact that toddlers are easy to please. I know, it sounds easy and uninteresting. But to your toddler? It will be tons of fun, I promise. Again, this one isn’t really an Easter egg “hunt”, but this was my toddler’s favorite method by far. Purchase a parachute (or use a flat sheet). Place all of the Easter eggs in the middle of the parachute. Have each child grab a section of the parachute, and on the count of 3, start shaking! The eggs will fly everywhere and your participants can run to grab as many as possible. Then, repeat! This kept my toddler (and her older sibling and cousins) busy for over an hour. It really is the perfect Easter egg hunt for toddlers. <—- You can read more about it here. This is a great option for an Easter egg hunt that includes older kids. Hide the eggs as normal for older children. For your toddler, tie a balloon to each of the eggs that you want your toddler to find. Let older children know that the balloon eggs are off limits. This will ensure that your toddler isn’t left out of the fun. Honestly, this egg hunt method works wonderfully for all ages. Have a child who doesn’t deal with losing very well? A child who gets jealous when someone gets more of something than they do? This egg hunt is the perfect solution. Even better, give each child a bucket of the same color as their eggs. This will help even very young toddlers to remember which eggs to find. This method allows you to actually hide the eggs a little bit. Give each of your kids a bingo card with photos or drawings of the hiding places. Arm your toddler with a marker and show her how to mark off each box as the eggs are found. This is another one of my FAVORITE toddler Easter egg hunt ideas. I love it because it’s cooperative, and it’s wholesome family fun. Partner your toddler up with mom or dad, and then older children can partner up together. This will give your toddler an advantage! Write a letter of the alphabet on each egg. Then, call out a letter and have your toddler run to find the egg with that specific letter. Perfect for 1 year olds, keep the bigger kids and toddlers separate by using a blanket. Keep some eggs on the blanket for your toddler to “find” and other eggs around the yard for the big kids. If your toddler is learning numbers, start with just 12 eggs. Write a number on each egg (or put a slip of paper inside the egg with the number). Then, right the numbers on the inside of an egg carton. As your toddler finds an egg, she can place it in the egg carton in the corresponding spot. Hide a golden ticket (or place a golden star sticker) inside one of your toddler’s eggs. Tell your toddler that if she finds the golden ticket, she gets an extra prize. Just make sure, using one of the ideas above, that your toddler is given the opportunity to get the golden ticket. What will you be doing for your toddler’s Easter egg hunt this year?